Sen. Kirsten Gillibrand Rules Out 2020 White House Bid - Joe.My.God. Kirsten Gillibrand says 2020 is not on her horizon. The junior New York senator vowed Thursday that she will not mount a challenge against President Trump in the next general election if she wins her midterm race next month. 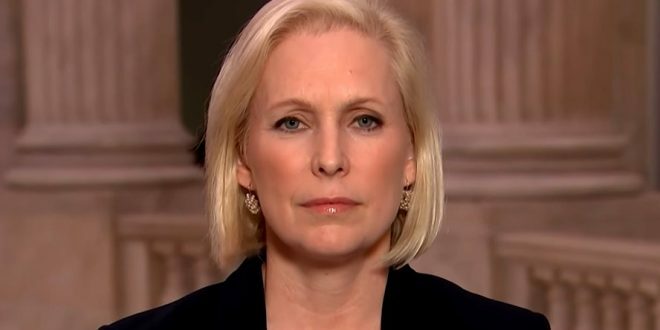 “I will serve my six-year term,” Gillibrand, 51, said when asked about her presidential prospects during an at times heated debate in Manhattan against her GOP challenger Chele Farley. Farley, a Trump-endorsed conservative who serves as the financial chair for New York’s Republican Party, scoffed at Gillibrand’s pledge. “Honestly, I don’t believe that,” Farley, 51, said during the ABC News-moderated debate, criticizing her opponent for spending time in five states other than New York in the past month, including New Hampshire, a crucial state in presidential elections because of its early primaries. Gillibrand is leading by 25 points.